Welcome. I’m excited to share my winter tablescape with you. 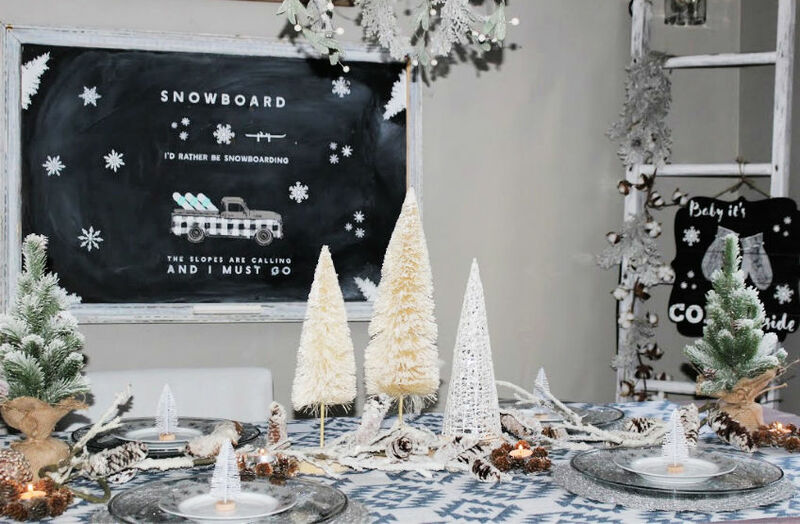 It includes pretty, rustic elements with pine cones, bottle brush trees and diy chalkboards! Living in New Hampshire we know a thing or to about Winter! As we speak, there is over a foot of snow from a wicked storm. It has been hovering around 2 degrees, so this Winter Tablescape Blog Hop couldn’t come at a better time! A big thank you to Ariel from PMQ For Two for hosting this fun hop. There are 16 bloggers participating throughout the course of the week. All the links are at the end of this post. 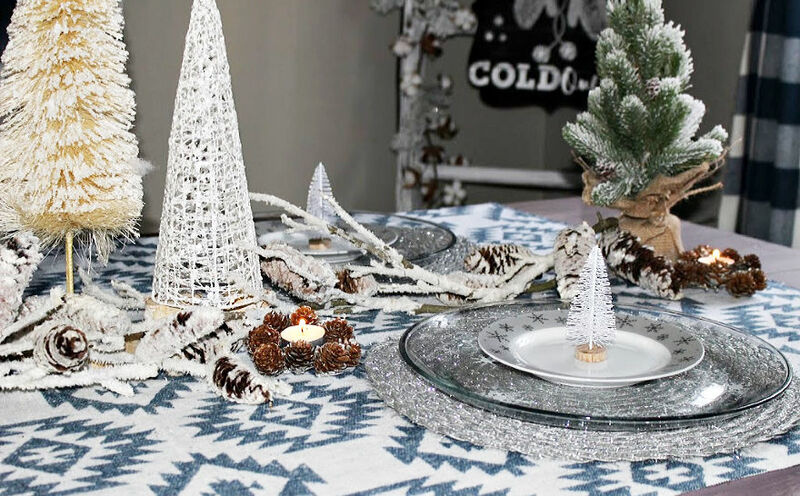 You are in for a treat when you see the fun Winter party ideas! If you have visited here before, you know how much I love decorating. I’ve talked before about how I normally start with an inspiration piece when decorating a room, or a tablescape. For this tablescape, the inspiration was this gorgeous print fabric I spotted at the craft store. 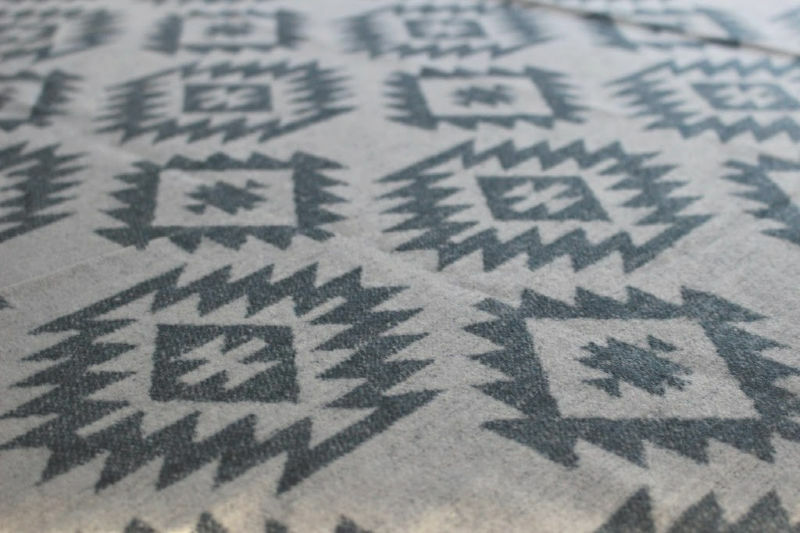 It reminded me of a ski lodge throw or rug and I immediately knew I would use this as a runner for my farmhouse table. If you are looking for an inexpensive runner or tablecloth, picking up a couple of yards of fabric on sale, or with a coupon, is a great option! Now that I had the runner, it was time to choose the place setting. As I enjoy setting a pretty table, I am always on the look out for dishes at the thrift store. I found gorgeous glass dishes for a song! 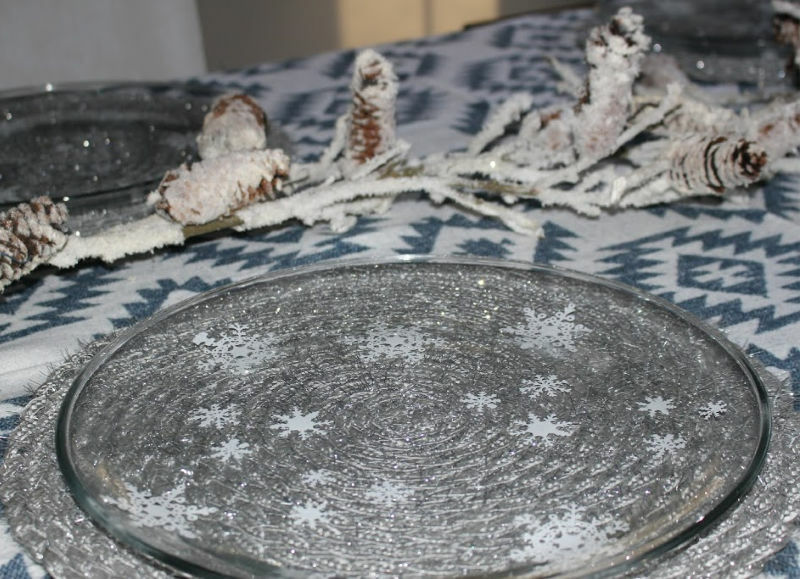 But they needed a little something for my winter tablescape, so I used one of my Chalk Couture transfers to add snowflakes to each dish. The cool thing is, this is totally temporary and once you run them through the dishwasher they are clear again! For someone who gets bored with decor as much as I do, that is huge! You can check out Chalk Couture products here. A great thing about decorating for Winter is, you can use a lot of Christmas items too. 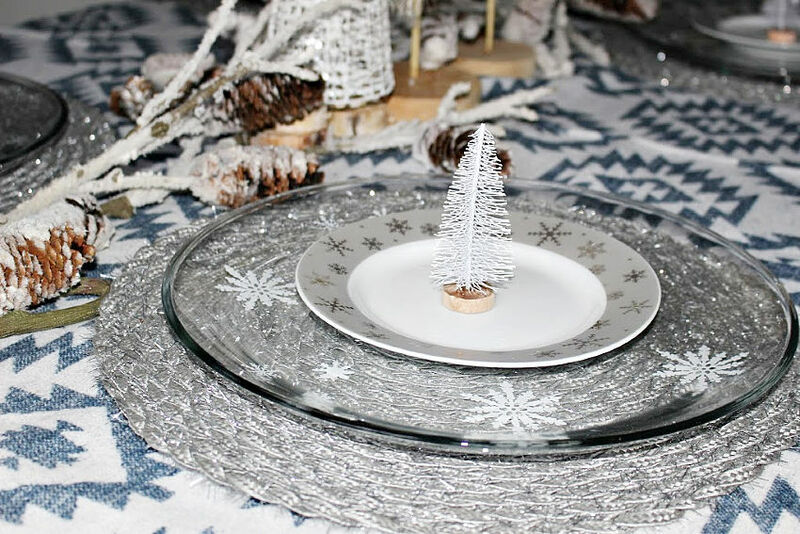 These snowflake plates were bought at an after Christmas sale, but are clearly perfect for my snowflake theme! And how adorable are those mini bottle brush trees? Another clearance bargain! 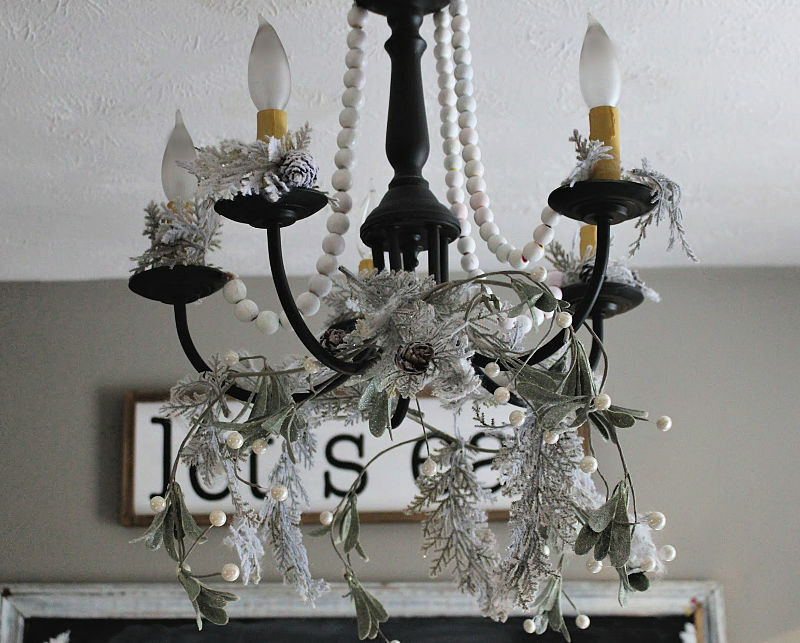 The only thing I did to change out the Christmas chandelier, was to remove the ornaments I had hanging from the arms. 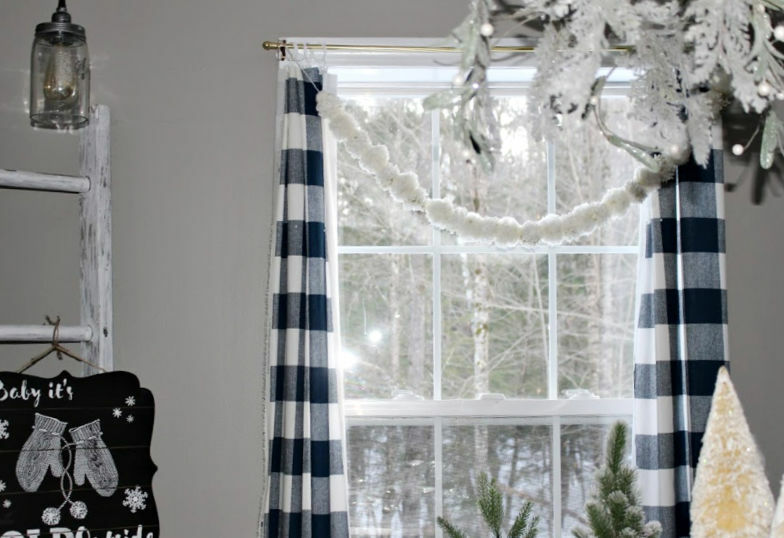 The frosted garland and pine cones totally fit with Winter as well. Another frosted garland drapes the vintage ladder and I added another Chalk Couture sign as well. Baby it’s cold outside couldn’t be more accurate! While I don’t snowboard-at all-I enjoy updating the oversized chalkboard for each season and Holiday. This chalkboard was an old bureau mirror in another life-you can see the tutorial here. 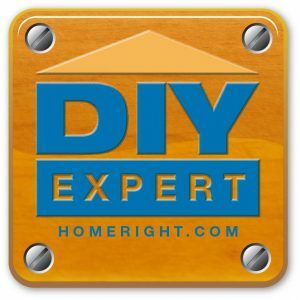 Pine cones can be used in home decorating from Fall through the end of Winter. I’m obsessed with these heavily flocked pine cone branches. At the last minute I used pine cone napkin rings as tea light holders! 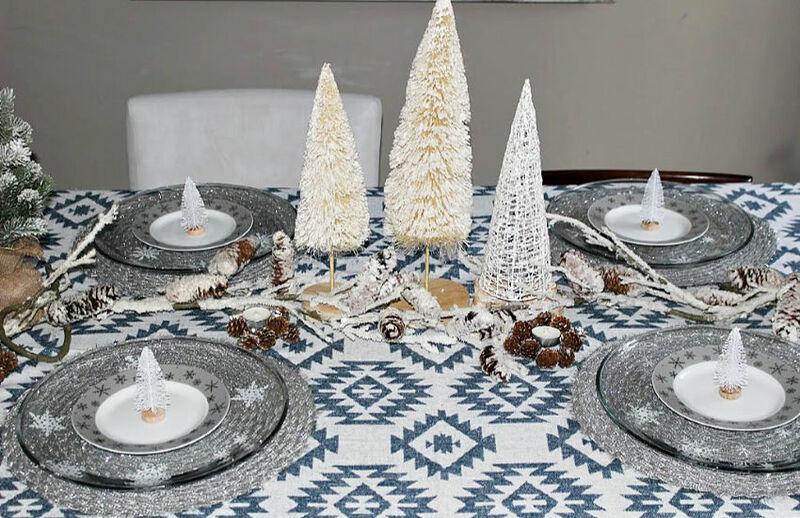 Gorgeous frosted bottle brush trees make a pretty centerpiece with little effort. I’m of the opinion that you can never have too many bottle brush trees. You can see how I used these in my Christmas Tablescape with a snowy woodland theme here. 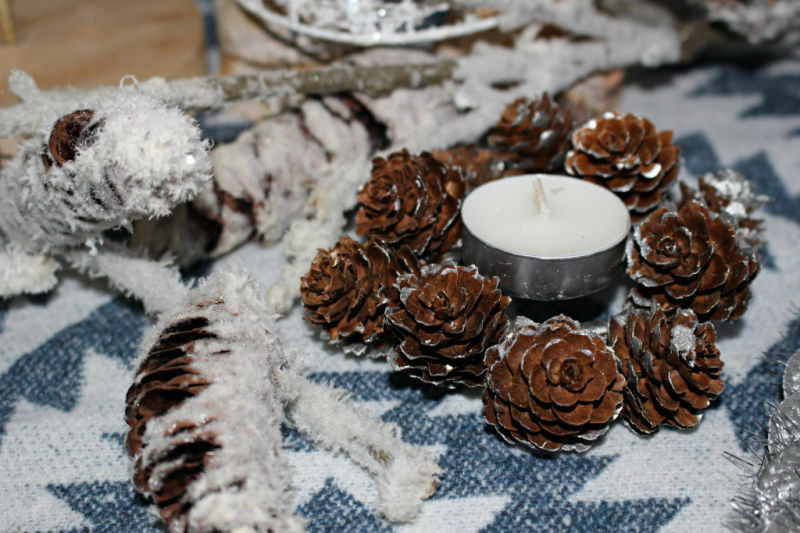 Well there you have it, my Winter Tablescape using leftover Christmas decorations and rustic pine cones. 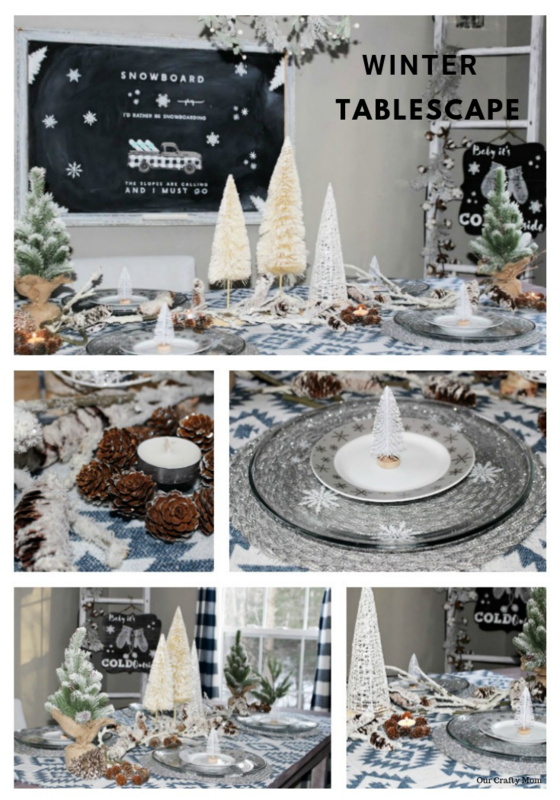 I hope you enjoyed this visit and will grab a cup of hot cocoa or tea and hop on over to From House To Home to see her beautiful Winter Wonderland Table Decor! Sharing is caring-pin for later! This is so much fun! I love your chalkboard. I use a similar process!! Thanks Amanda. I love chalkboards, but my writing is awful, so using transfers makes it so easy! love the fabric you used–so pretty! Thanks so much Gretchen. I fell in love with it the moment I saw it! 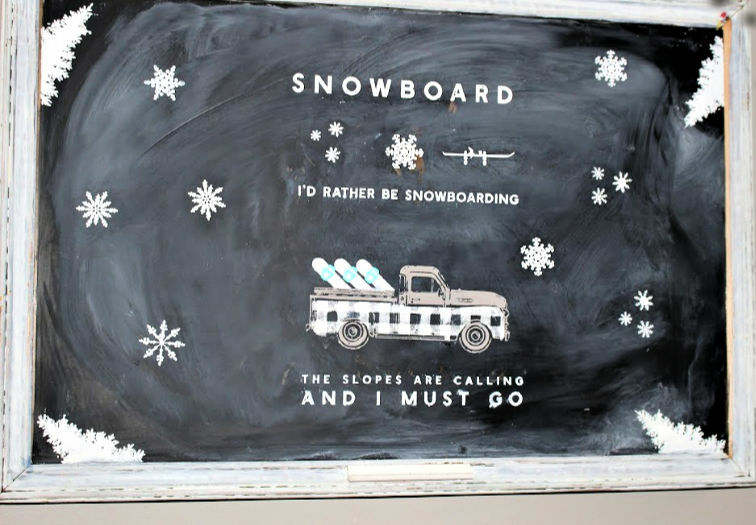 Love your chalkboard with the truck and snowboards! Great ideas too! Super cute idea with the chalkboard! It all turned out so pretty! Oh my goodness, I would love to see this in person. It must feel so magical to be in there! 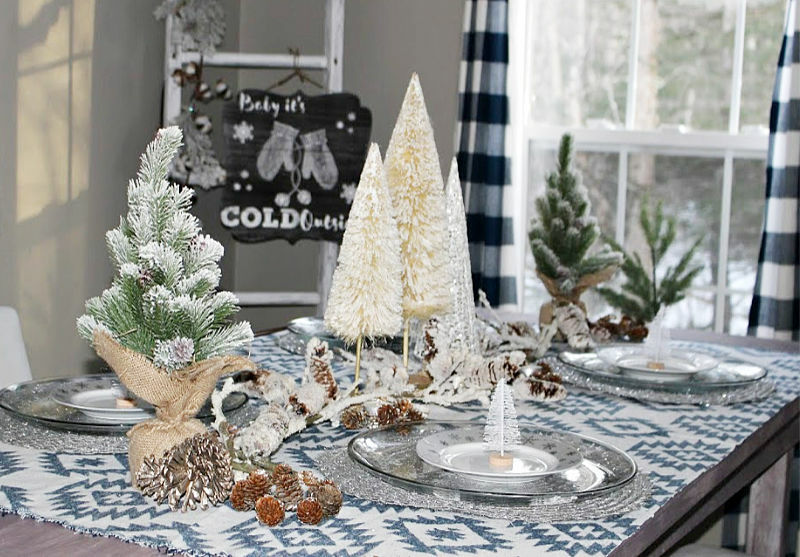 Beautiful winter table and room. Thanks so much Kathy. I really enjoyed this one. Probably because of the foot of snow outside, lol! Looks beautifully wintery! Loving the sign and the pieces you added to the chandelier. Im loving all of your trees! 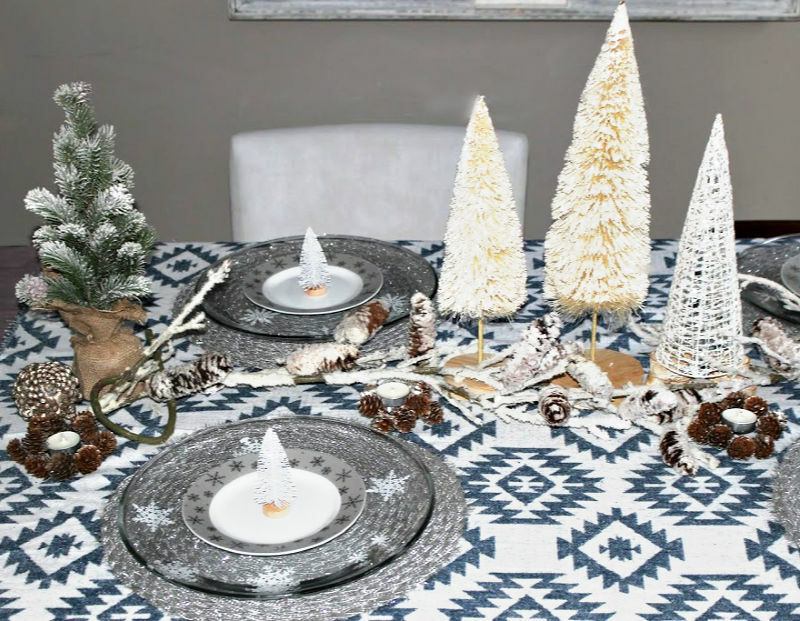 this is the perfect winter tablescape! Thank you so much! It was a fun Hop! Such a pretty table! I love all the chalkboard elements. So fun! Love that fabric that you used for your inspiration! Such a fun table! I see that same snowflake salad plate in the future of my blog. 😉 LOL! 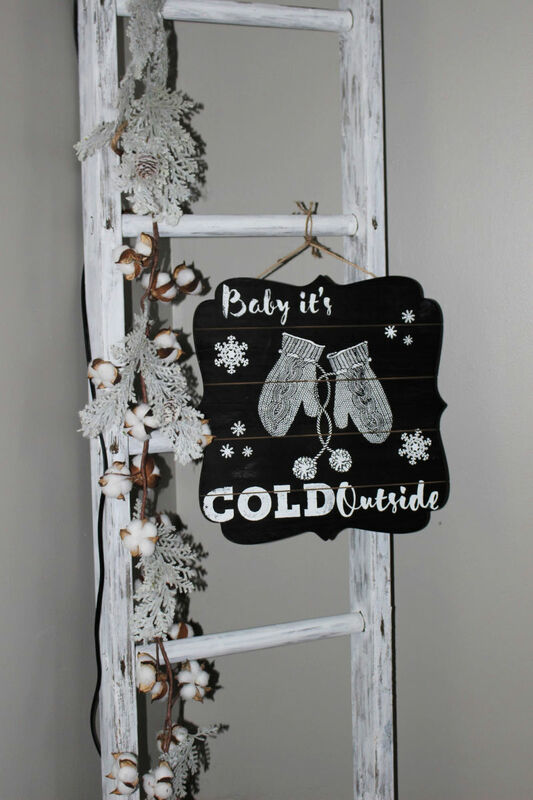 Love your ‘baby it’s cold outside’ sign, Michelle! 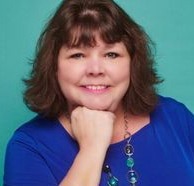 Thanks for sharing on Homestyle Gathering, my friend!